Karen bought the house in 1992. After meeting then marrying Kirk a couple of years ago, the couple decided it was time to reinvent the house in a style they love. They spent an entire year planning, gutting, and rebuilding the house, finishing the job this past spring. It was a long and stressful year: They survived a difficult contractor change, bug and water issues, and even a close call with an accidental gas leak that brought fire engines to their house. Their plan was to turn a 3-bedroom, 2-bath bungalow with small closets, a bad roof line and a wet stinky basement into a 4-bedroom, 3.5-bath bungalow with amazing closets, a spectacular roof line, and a dry, sunny, liveable, walk-out basement. 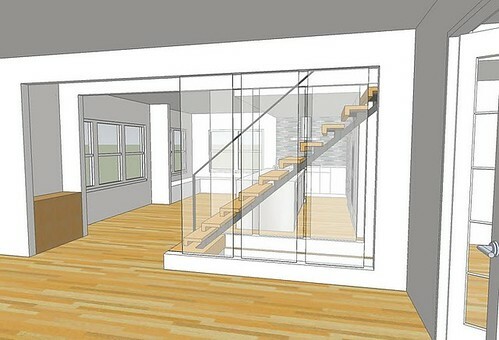 The entire first floor was completely gutted and reconfigured. In this before shot, you will see how the front porch was extended to expand across the entire front of the building. Karen and Kirk love the new, larger outdoor space with room for casual seating and outdoor dining. By adding on to the side of the house, they were able to expand the den and add a first-floor powder room. 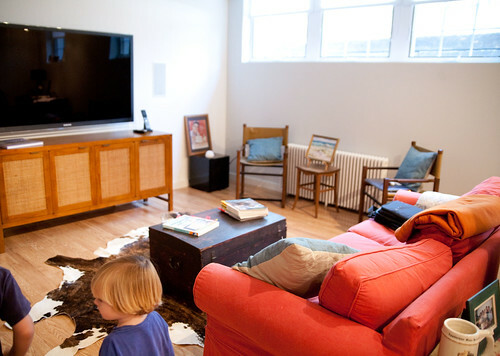 The den, which is Karen’s favorite room in the house, is bright, comfortable and has lots of character. It features a Polder sofa, Indian Charpoy coffee table (made with woven silver ropes that sparkle in the sunlight), and Nias Tribal Stools. I love how the simple light gray walls are counterbalanced through the use of texture (nubby rug, woven table, and baskets) and pattern (ottoman, pillows). 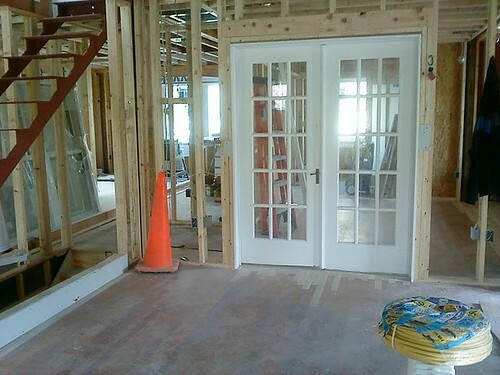 Here is the view to the powder room. The door on the right leads to the front porch. 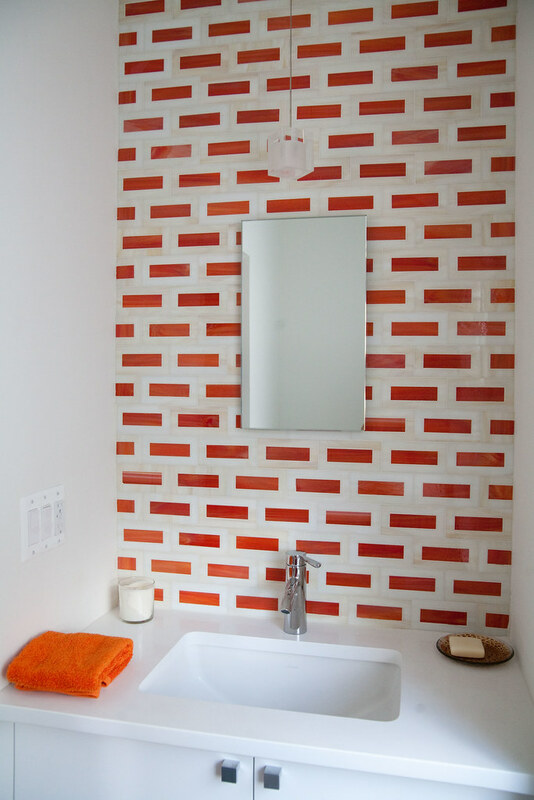 Karen added a pop of color in the bathroom with this amazing orange tile. The small square pendant lamp works hard but is not afraid to let the tile steal the show. The final product has wow factor written all over it. It’s the first thing you see when you walk in the house, an unexpected modern visual that sets the tone for the rest of the open space. Now, the walls are gone down and it’s one big fat gourmet kitchen, dining, and entertaining area. Karen and Kirk love to host parties so having a large open concept space was a must. 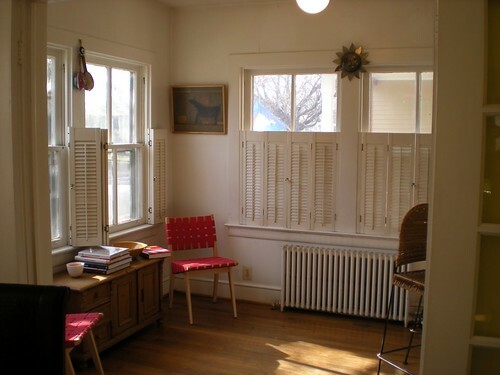 The former sun room now has bench seating along the corner walls. The benches open with plenty of room to tuck away linens and large serving platters. 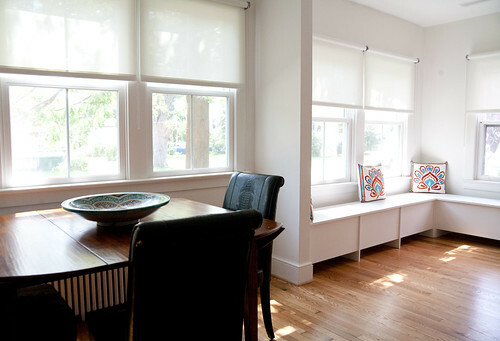 The dining table is from Bungalow Homewares in Del Ray. It’s been known to seat as many as 15 people for a dinner party. The kitchen is a chef’s dream — it boasts a professional grade stove, Subzero refrigerator, two sinks (a small prep sink nestled into the corner to the right of the stove and a large sink in the middle of the island for washing pots and pans), two dishwashers, a wine fridge, ample storage in the IKEA cabinets, and miles and miles of caesarstone counter space. Guests can take part in the culinary action on one of three Cherner bar stools. 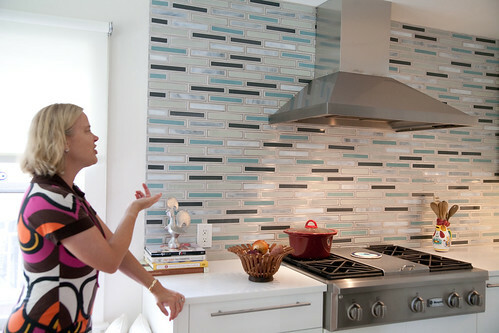 The stove backsplash is made with the same tile featured in HGTV’s 2010 Dream Home. Shortly after purchasing the tile, the company went out of business. Karen and Kirk are now the only people on the East coast with this tile. 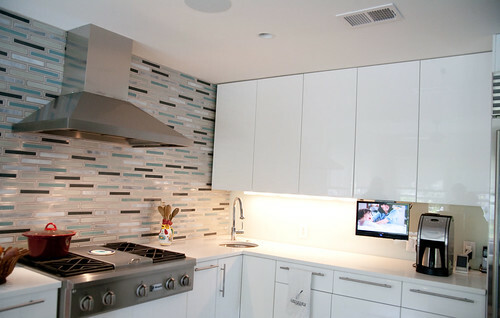 On the adjoining wall, they used frosted glass from Del Ray Glass as the backsplash — who knew a sheet of glass could look so fancy! 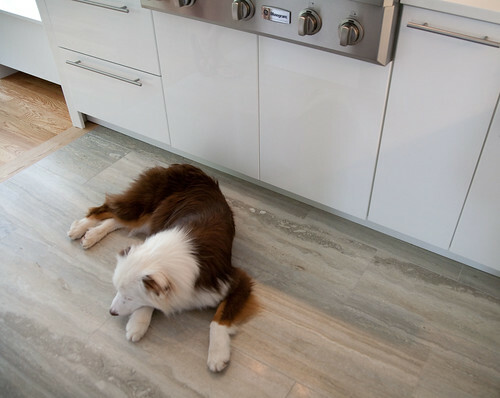 Boomer, the dog, loves the travertine floors. 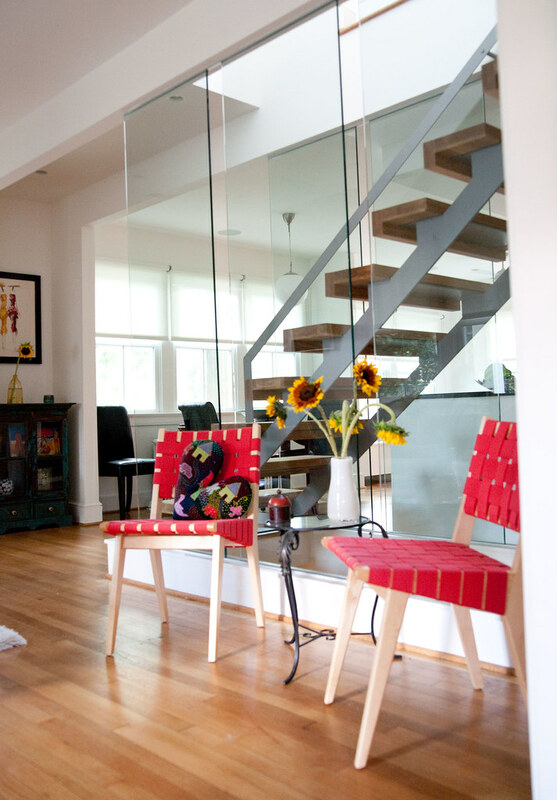 Karen loves them too — not only do they bring the colors of the room together, they easily hide dirt and pet hair. The wine cabinet was a happy accident. Due to a mismeasurement, they ended up with extra space at the end of the wall. One option was to add a broom closet. 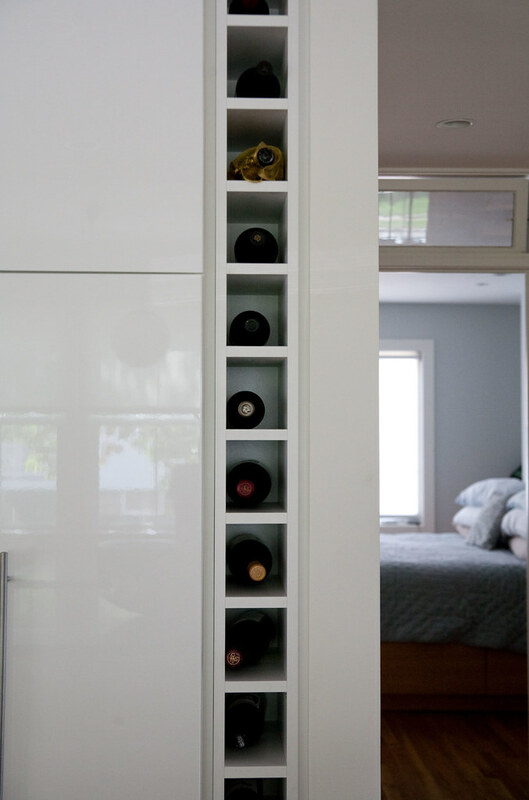 They decided on a wine cabinet — it looks like it was meant to be. One thing that’s hard not to notice is the fact that there are so many windows — some new, some original to the house (like these flanking the fireplace). With a multitude of windows, there is not much wall space for art. 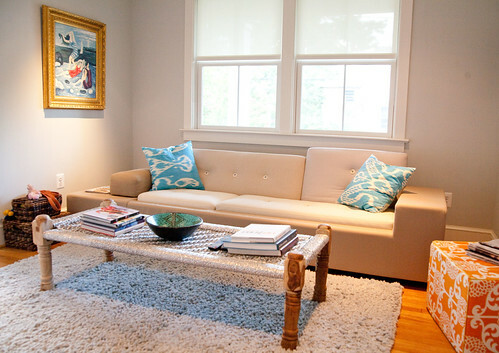 Karen and Kirk added color and personality through vivid accent pillows and eclectic furniture and accessories. The metallic pouf is simply fabulous! The living room and the previously mentioned den play well together with their similar color palettes, rugs, and furniture scale. There’s one more room on the main floor — the master suite. This is another place where they added extra square footage — about 8 feet to the right side of the house. As a result, they had plenty of space for a custom-built king-size bed and storage cabinet, walk-in closet, and a true master bathroom. 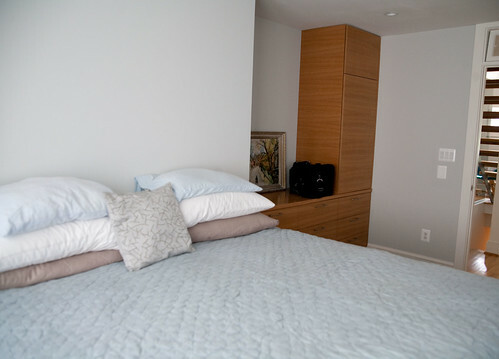 Karen noted that although the bed and cabinets were custom-built, they cost less than buying from a store. There are drawers underneath the bed for extra storage. 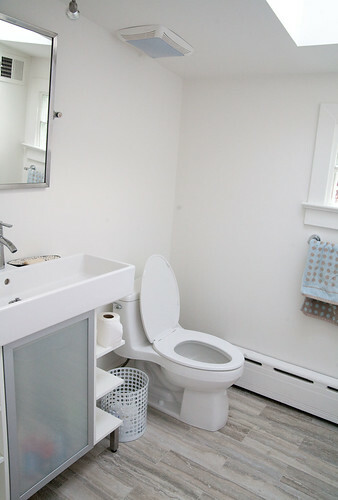 The bathroom gives new meaning to the term spa-like. It’s modeled after a hotel bathroom Karen and Kirk discovered while on their honeymoon in South Africa. The walk-in shower with rain shower head, teak bench and river rock floor is one of Kirk’s favorite areas of the house. 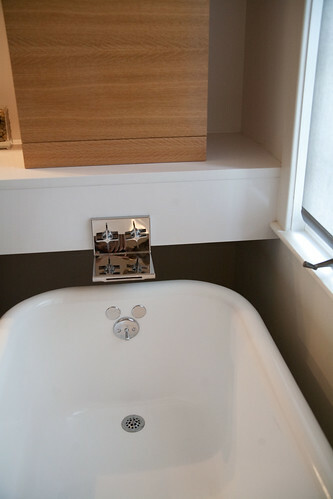 The tub is actually the original tub from the house, accented and modernized with new fixtures. Another bonus for cold winter mornings: the floors are heated. 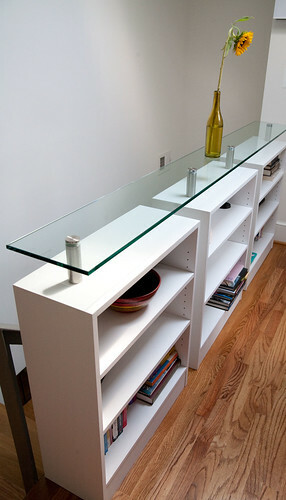 Upstairs, this ingenious bookcase replaces the former railing. 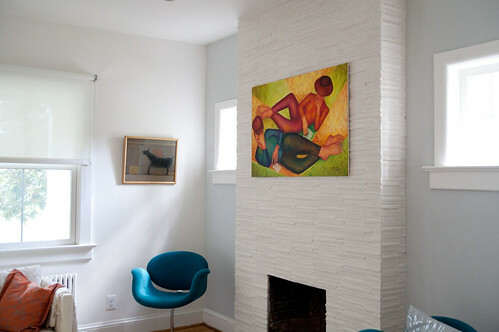 I’ve been wanting to replicate this in my own house ever since seeing it in a house on the 2010 Del Ray Home and Garden Tour. What a great use of space. The footprint of the upstairs did not change during the remodel. Aside from adding the bookcases, they applied a fresh coat of paint to the hall and two bedrooms and added new fixtures to the bathroom. The white paint reflects the bright sun radiating from the skylights. 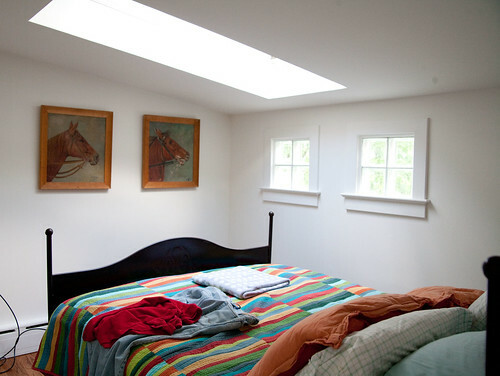 Having sloped ceilings, skylights make a huge difference, adding a sense of height and openness. The skylights were already installed when Karen purchased the home in 1992. 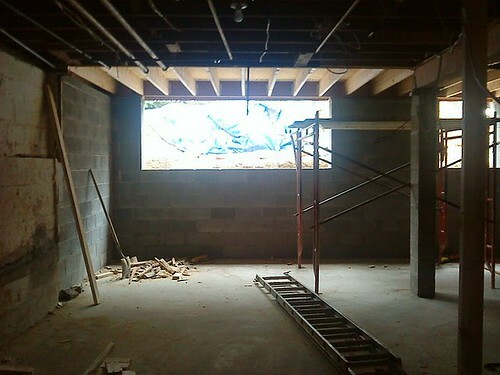 The basement is still a work in progress, but it’s one of the nicest basements I’ve seen in Del Ray. The great room is more than great, it’s amazing — with high ceilings and large windows, you hardly feel like you’re partially underground. Here’s a shot during construction — note the large hole for the windows. This side of the building is new. Today, Kirk uses one side for watching television and Karen uses the other side as her home office. A full bath is tucked under the stairs, and around the corner, you’ll find the laundry/storage room which incorporates the old kitchen cabinets. It took a year and many frustrations, but Karen and Kirk finally got the home of their dreams. 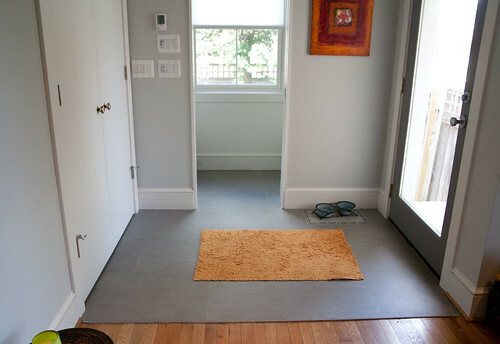 Karen’s advice for someone undertaking a major renovation like this: Go with your gut. They had to switch contractors months into the project; this was time lost and money wasted. Karen says make sure you are comfortable with whomever you choose to help with a project. If something doesn’t feel right, make a change. Why would anyone buy a great Craft-style bungalow in our wonderful neighborhood and turn it into a Tribeca loft on the inside? Sorry, but I don’t share your enthusiasm for such a modern look. I don’t care how “green” they say it is. It was extraordinarily wasteful to throw out its charming interior. Thank you for your comment and your honesty. We understand this style might not be for everyone. The owners did maintain many of the charming features of the 1920s home including the original windows, transom, radiators, and the tub. When adding on to the side of the house, they kept the original exterior look. They also kept the french doors that led to the orginal sunroom and moved them to the den off the main entrance.The second floor did not change at all, except for some updated features in the bathroom. If anyone else has strong feelings either way, we’d love to hear from you! I’m not a modernist, but this house looks fantastic! Before you knock it, I encourage you to take a look during the 2012 House Tour. As the writer stated, they kept many of the “old” features — French doors, tub, etc. — and then made it into a house that is both a showpiece and a home. Wow! What a great space for entertaining … and living! Wrap-around porch is beautiful addition and very “Del Ray.” Kitchen is very modern but, if you are going to entertain, you need to have space and openness — great job on both! 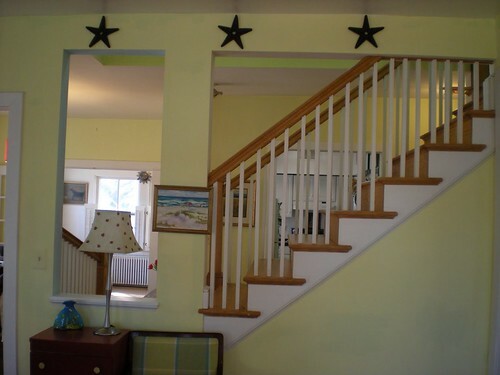 If I had just seen the artist’s rendering of the staircase, I would have been scared, but what a wonderful way to walk into a home — and be able to see everything all at once! Will definitely take a look during the home tour. Sorry, have to disagree with Reba. While I’m a big fan of the Craftsman look, this strikes me as a very tateful update. Also, I think of lofts as being very “cold” but this seems warm and inviting! What an elegant renovation! A charming enhancement to the Del Ray community. I couldn’t agree with you more Alexander. Looks like an elegant update that marries the old with the new. And a perfect fit for artsy, forward thinking Del Ray. The bungalow is repurposed yet still has classic “bones”. And what guy wouldn’t love the giant TV in the basement? A updated “man-cave”! 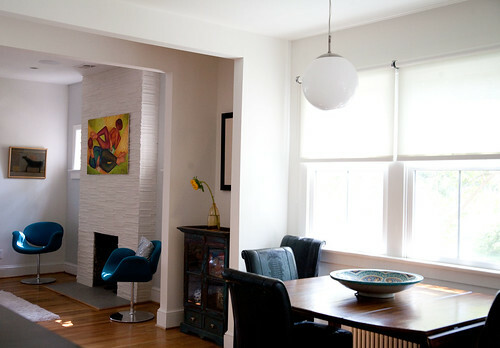 The house looks terrific and very creatively uses the space, while maintaining the classic exterior. 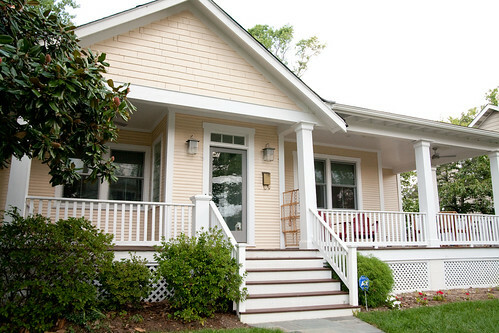 Why would anyone change the inside of a Craftsman bungalow? Because its not 1930 anymore. We all update our homes to meet our needs, so someone should go easy on the judgement. It’s Karen and Kirk’s home, and I applaud them as they enjoy the fruits of their labor. They embody Del Ray. Absolutely fabulous! Functional, beautiful, and perfect for entertaining. We can’t wait to see it in person! Hi Katie, Awesome blog. I will post a link on my facebook page. Just found this site and enjoyed looking at the photos and postings. Congrats to the homeowners for surviving the remodel with marriage hopefully intact. I personally don’t care for the modern minimalist look (unless it’s more of the amish quaker style) and am glad this style was limited to the homes interior. 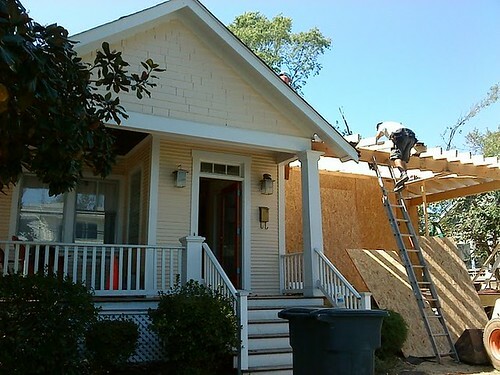 Would be interested in recommendations on small builders experienced in remodeling Del Ray homes. We are moving back to our house after many years out of state and plan to add an addition and re-do our kitchen and baths. Thanks for any leads. Hi — Glad you found our site! The architect and builder for this home reno are listed at the bottom of the story. Harry Braswell is another home renovation company that just completed a renovation and transformation of an old farmhouse into a cafe in Del Ray. It looks magnificent. Also, you can get great contractor referrals from the Del Ray Citizens listserve. Good luck with your move back to Del Ray! 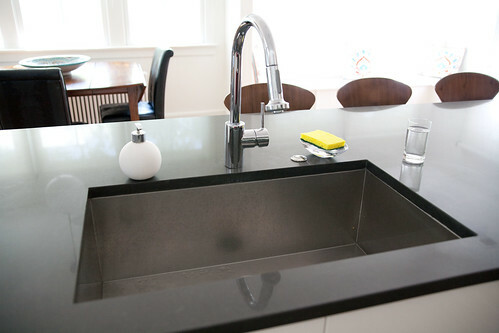 Let us know how your renovations go — we’d love to share your experience on this site. I’m with Reba. Thankfully it still looks like a craftsman style home on the outside.